Every first Friday of the month at 8 pm local Greek Kiwi, Nicos Tescos presents a Greek music show full of song, history and information in both Greek and English. 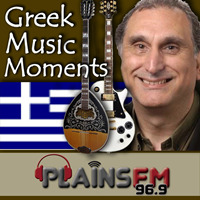 You'll hear a variety of Greek music - folk, traditional, pop, rock, new-wave, old and new. This show will appeal to people of all ages who have an interest in world music and also for Greeks living in New Zealand who miss their music, culture and language. Nicos has a deep experience of music - he started playing guitar and bouzouki in bands in Athens, Greece as a teenager. He also founded the Christchurch band “Hellenic Sounds” in 1989. Contact Nicos by email on greekmusicmoments@gmail.com or via his Facebook page: Greek Music Moments with any comments or requests. We are a live band playing vibrant Greek traditional music and songs. Our aim is to get everyone up and dancing, have fun, bring people together. We are available for weddings, conference parties, birthdays, festivals, concerts, multicultural events and more. Send us a message.